Towards the end of the Steptoe series, Ray and Alan started to introduce episodes that included a larger cast. Back in Fashion has the yard awash with photographers and a whole lot of birds. 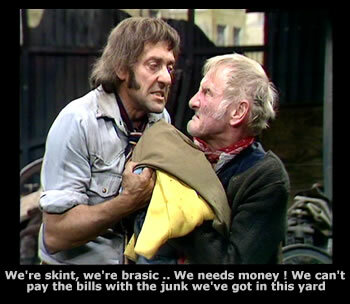 Having said all of that this episode starts off with classic Steptoe with Harry and Willy bickering in the yard as they go through the various items that Harold has brought back off the round. Albert sets his eyes on a bag of rags that Harold has acquired. Going through the bag Albert reckons there is some good stuff here and suggests the contents would form the basis of his winter collection. Harold had had enough stating that the things he brings back off the round are to sell, and not to go into Albert’s wardrobe. What’s the point of a winter collection ? Albert always wears the same clothes? 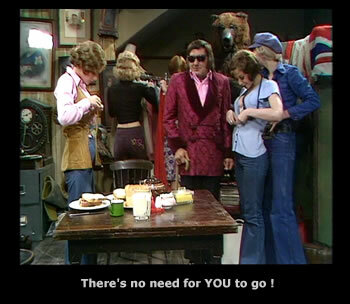 In the end Albert is insistent that he keeps a nice yellow jacket, Harold is equally insistent that it is to be sold. They start to argue over the jacket and in the tussle the jacket sleeve gets ripped of. An act of pure vandalism in Albert’s book. While Albert and Harold go indoors to continue their bickering, two men arrive in the yard. A photographer and his agent. It comes as a shock to them both to find Albert confronting them with a revolver. Harold disarms him. It appears that they want to use the yard as contrast to the glamour models they are going to be photographing for Vogue magazine. Albert conducts the financial negotiations in true Steptoe style and all is set for the photo shoot tomorrow. The girls can use Harold’s room to change if they like, after all it has got a mirror and a comb !! The following morning Harold comes down to breakfast not dresses for the rounds at all, in fact he is wearing a very dated velvet smoking jacket, dark glasses and a walking cane. He explains that he can’t go out of the rounds as he has a “slight headache”. Albert sees through this and realises that Harold is trying to impress the models that are soon to arrive. Albert brings him down to earth by explaining “You don’t think you’re going to get a tumble off one of the do you”. The girls arrive and in no time at all they are starting to undress in the lounge. One of the girls in particular takes particular care of Harold, making sure he doesn’t bump into things. When Harold suggests he leave and the girls undress she states “there’s no need for YOU to leave”. It suddenly hits Harold that the girl has misunderstood his circumstances “I’m not blind” he shouts in a room full of semi-naked girls, only for the girls to shriek as they try to cover themselves. As Harold leaves to room he finds Albert trying to peep through the keyhole. In his attempt to thwart his Father’s spying it is Harold who appears to the girls to be a dirty old man, much to Harold’s frustration. With the shoot underway things aren’t going to plan. Suddenly Harold makes an inspired suggestion. A male model may help spice things up a bit. “Alright, get yer work clothes on” he’s told. Could this be Harold’s route to fame and a Vogue bird to boot, or will Albert manage to get one over on his son. A photographer want to use the squalor of the yard to compliment his Vogue magazine shoot.